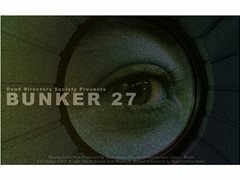 Bunker 27 is a short horror/ thriller set in an underground bunker. A group of volunteers are victim to a twisted experiment by a shadowy organisation. Slowly one of them transforms into a monster, set to murder them all. Rehearsals and Production to take place in the middle of March. Sophie’s role in the bunker is that of the older sibling, she wants to keep the peace and make everyone comfortable. In the second half of the film she steps into the protagonist role and confronts the monster. Leo has been in and out of prison his whole life. He is hostile to the other people in the bunker, wanting everything to over as quickly as possible to get back to his life. Danny is socially awkward and finds it hard to interact with the other people in the bunker. He is intimidated by the whole situation and becomes increasingly timid throughout the film.